It is getting cool when the sky begins to darken on June 30th. As we get out the car, we can hear the excited voices of children, see the various colors of yukata (Japanese garment) and the many yatai selling takoyaki (octopus ball), watagashi (cotton candy), ningyo-yaki (something like sponge cake) and so on. People form lines to the yatai that line the way to Sugimoto shrine. We push our way through the crowd and walk through under a Torii (a gateway to a Shinto shrine) and catch sight of the big circle about 250cm woven from imperata cylindrical–the “circle” festival is well under way. The big circle woven from imperata cylindrical. People first came to worship a god in Ino in 880. Beyond that, little is known as flood destroyed the old records of the Sugimoto shrine. The 1000th anniversary was observed in 1882, 1100th anniversary was celebrated in 1982. The Oharae festival is held not only in Kochi but also in many shrines in other prefectures on July 30th every year. The purpose is to give thanks to the god for getting along well for half a year and pray for good health for the rest of year. Oharae is also called wanuke-sama (輪抜け様) in Kochi. “輪(wa)” stands for “a circle” and “抜け(nuke)” stands for “to go through”. On the way to go to the main hall, there are some carp streamers on both sides above our head even though it was the end of June and not the season for it. They are flying in the wind as if they were alive. In the shrine office, one woman dressed in the shrine’s special uniform (a maiden in the service of a shrine) is selling many kinds of lucky charms. In front of the circle we pass through, there is a place called “Temizuya” to wash our hands and our mouths and many people are lined to do the purification. 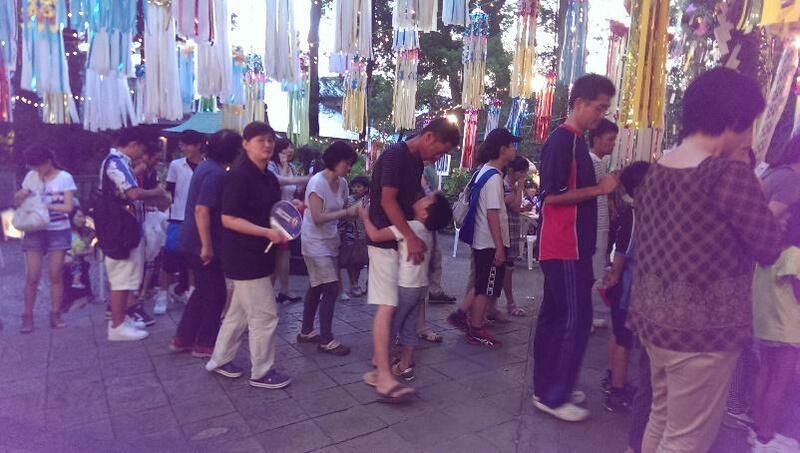 It shows us the politeness and honesty of Japanese people. After finishing, we are finally ready to go through the circle! By the circle, three old men are standing and telling people how to pass through the circle. Some people are passing through the circle the wrong way, so they are gently corrected. When we go through a circle, it is better to repeat the Tanka poem. Actually there is another kind of poem to repeat, but this is more common. Women are supposed to go around from the right side, men are supposed to go around from the left side as if the symbol of infinity. After going through the circle, we walk to the mail hall of the shrine. We go up the stairs and we can see the main hall with many shining decorations. They look like beautiful floating jellyfishes. In front of the main hall, we put the “Hitogata” into the box provided near an offertory box. “Hitogata” (人形) is the paper drawn a picture of the person. We write down our age, Chinese astrological sign, and gender. After writing, we rub the paper onto our body to get rid of our ill luck and wish for the bad parts of our body get well. As for us, we rubbed Hitogata onto our head because we hope to be smart. We did a basic manner prayer, ‘Twice bowing, twice clapping and one-time bowing’ We call this nihai-nihakusyu-ippai (二拝二拍手一拝). This is a form of worship based on Shintoism and is to purge the person of sin and declare determination to change one’s mental attitude. The way of Shintoism worship is different from Buddhism. When we visit the temple, we join our hands together in prayer. 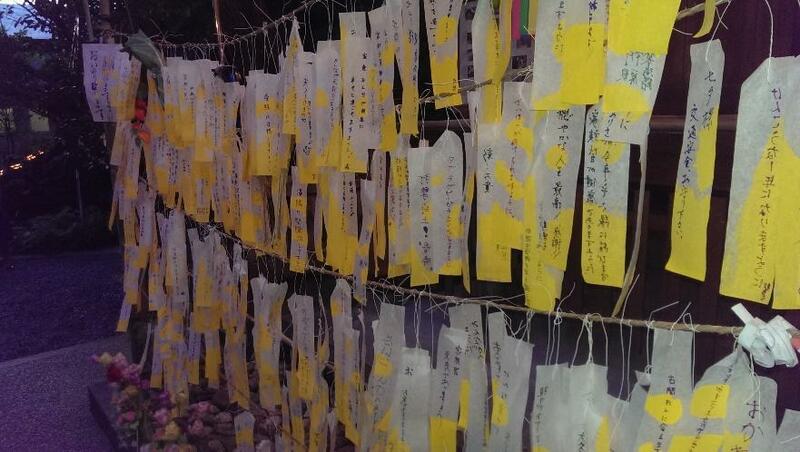 On both sides of the shrine’s main hall, we find strip of papers for Tanabata. 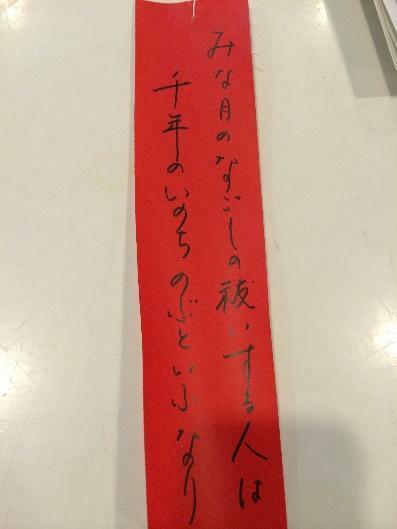 We believe that our wish comes true by writing it down on the strip of paper and hanging the strip of paper to a bamboo leaf. Tanabata is one of the seasonal festivals. Generally, it is held on July 7th. 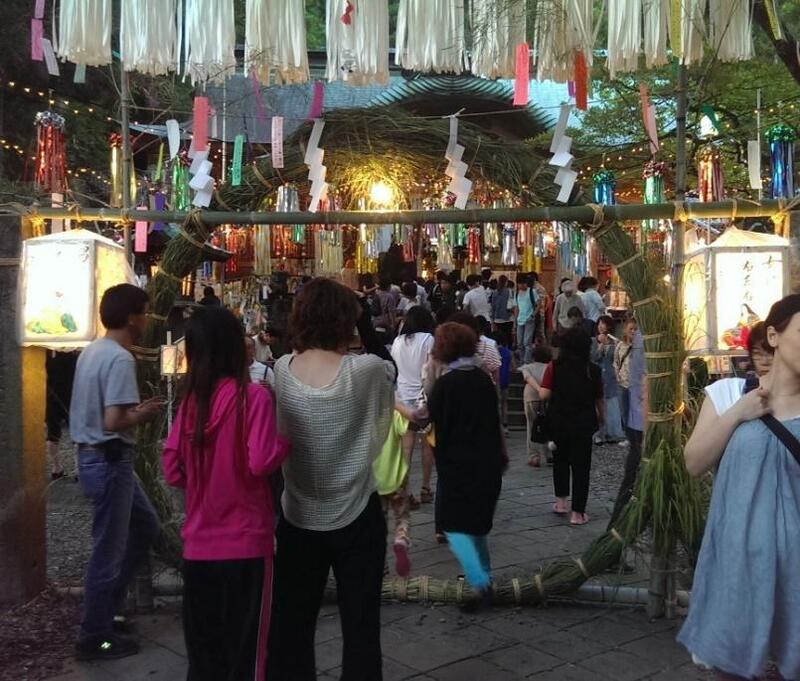 In Sugimoto shrine, they hold Tanabata and Oharae festival at the same time. “Why don’t you write down your wish on this strip of paper?” a father says to his son. He is 5 or 6 years old and seems to be not used to writing characters yet. He writes his wish slowly with his father helps. We watch and smile. Why do people pass through the ‘circle’? Why is it not square or triangle? Taking another example from Sumo, they fight in the circle ring. The circle is used in this situation as well. We were curious if the circle has a special meaning for Japanese people or not so we asked the owner of Sugimoto shrine about this. However unfortunately she didn’t know. Japan’s national flag represents the rising-sun. This flag was made in 1939. It is said that Wanuke festival started from 1940, so we guess that for Japanese people are proud of this flag, and the circle of Wanuke festival also represents the rising sun. “Every time I come to this festival, we can meet neighbors or people we know and we enjoy chatting with them,” one woman with her family says to us. The people all seem to from Sugimoto shrine neighborhood. We can hear Tosa dialect and people enjoying the private chatting. Also we see a mother who is wearing a kitchen apron. It is clear that Wanuke festival has its own regional characteristics. These days, the chances to communicate with neighbors have been decreasing. Because of the urbanization, high buildings have been increasing and many towns have lost their individuality. But we cherish our hometown every time we participate in such local festivals. This festival is important to communicate with local people once a year. Through the festival we can feel a change of season, too. As we leave the shrine, the director says to us, “Why don’t you come to Ino shrine as ‘巫女さん’ next time?” We would like to participate in wanuke-sama wearing special uniform next year! Previous Kochi Organic Market in Ike: Let’s Eat Organic! I love these small local festivals. I’m lucky to live in Asakura and get to see the real old Japan. I don’t feel like a “local” exactly, but I’m not a stranger, either. It’s heartwarming.